This information brief is a continuation of the FHWA Office of Operations Transportation Systems Management and Operations Benefit-Cost Analysis technical briefing series. Earlier briefs were published in 2012 and are available online at: http://www.ops.fhwa.dot.gov/plan4ops/resources/brochures.htm. 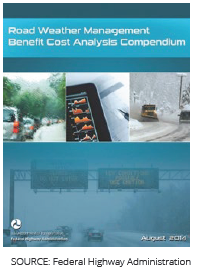 This technical brief explains a basic approach to economic analysis—specifically, benefit-cost analysis (BCA) as applied to road weather management (RWM) practices. It contains some of the fundamental concepts required for RWM BCA and explains the usefulness of BCA methods in understanding and evaluating RWM projects. The methods are demonstrated in a number of RWM BCA case studies conducted around the United States by transportation agencies and research organizations. Economic analyses can inform many different phases of the transportation decision-making process and in particular facilitate a specific selection of the most impactful RWM strategies. Such analyses can also assist engineers in the development of the most cost-effective designs once a decision has been made to go forward with an RWM project. In planning, economic analyses can be applied to basic cost and performance data to screen a large number of potential RWM project alternatives, assisting in the development of program budgets and areas of emphasis. Similarly, such efforts can play a critical role in screening alternatives for accomplishing a specific RWM project goal and provide information for the environmental assessment process. Economic analysis is a critical component of the road weather management (RWM) planning processes that considers all key quantitative and qualitative impacts of RWM investments. It allows highway agencies to identify, quantify, and assign a value to the economic benefits and costs of RWM projects and programs over a multiyear timeframe. With this information, highway agencies are able to allocate scarce resources to maximize public benefits as well as to show a rational basis for their decisions. Few agencies regularly measure particular project net benefits in monetary terms. Also, most agencies do not consider the full range of costs and benefits when conducting their analyses. In general, there is significant potential for the broader application of economic methods in RWM decision making. Identify constraints and specify assumptions. Define the base case and identify alternatives. Define the level of effort for screening alternatives. Analyze the traffic effects of base case and alternatives. Estimate benefits and costs relative to base case. Compare net benefits and rank alternatives. As part of its long-term commitment to improving highway operation investment practices, including RWM strategies, FHWA continues to develop and advance economic tools and guidance. 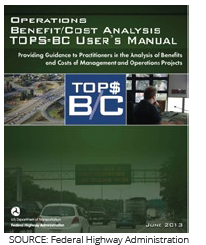 One tool already available to conduct a BCA of transportation planning procedures is the Tool for Operations Benefit Cost Analysis (TOPS-BC, for more information visit http://www.ops.fhwa.dot.gov/plan4ops/topsbctool/index.htm), provided by the Federal Highway Administration (FHWA). TOPS-BC is a sketch-planning-level decision support tool developed by the FHWA Office of Operations. It is intended to provide support and guidance to transportation practitioners in the application of BCA for a wide range of Transportation System Management and Operations (TSM&O) strategies, including RWM. Some of the case studies presented in this technical brief applied TOPS-BC in their planning process. Long-lived RWM projects requiring initial and periodic capital outlay and ongoing materials and maintenance expenditures can especially benefit from project investment and life cycle evaluation. BCA attempts to capture all benefits and costs accruing to society from a project or course of action, regardless of which particular party realizes the benefits or costs, or the form these benefits and costs take. Used properly, a BCA reveals the most economically efficient investment alternative; i.e., the one that maximizes the net benefits to the public from the allocation of resources. These methods are also useful in evaluating RWM projects and strategies. Cost Effective Design and Deployment. A BCA can inform highway agencies as to which RWM project designs can provide the lowest life-cycle cost to the agency and the lowest user cost to the traveler. Best Return on Investment. It can help in planning and implementing RWM programs with the best rate of return for any given budget, or help determine an optimal program budget. Understanding Complex Projects. In an era of growing public scrutiny of new and costly road projects, highway agencies and other decision makers need to understand the true benefits of RWM projects and their contribution to highway performance and regional economies. This information is often very helpful in the environmental assessment process. Documentation of Decision Process. The exercise of quantifying and valuating the benefits and costs of RWM projects also provides excellent documentation to explain the decision-making process to legislatures and the public. Feasibility of RWM projects. Whether the project's life-cycle benefits will exceed its costs and whether it should be undertaken at all. Point in time of RWM project initiation. A BCA may reveal that the RWM project does not pass economic muster now, but would be worth pursuing 10 years from now due to projected regional traffic improvements. If so, it would be prudent to take steps now to preserve the future project's right-of-way. RWM project alternative decision making. Given the limited budget of transportation agencies, a BCA can be used to select from RWM design alternatives that yield different benefits. Decision support, control and treatment. The Utah Department of Transportation (UDOT) implemented a weather operations program that assists the agency's operations, maintenance, and construction functions by providing detailed, often customized, area-specific weather forecasts. Established under the UDOT Traffic Management Division, the Road Weather Management Information System Program is responsible for deploying and operating a number of TSM&O strategies in the region. The goal of the BCA was to determine the benefits and costs associated with outputs from the weather operations program, specifically in the context of winter maintenance. The study,1 published in the Transportation Research Record, developed an artificial neural network model of winter maintenance costs. It calculated the labor and materials cost for a given maintenance and materials storage facility (shed) as a function of several key factors. The model used for the research study was developed by the authors based on winter maintenance cost data from UDOT maintenance sheds during the 2004–2005 winter season to estimate the costeffectiveness of the program. As a result, the paper estimated that the weather operations program in place saved UDOT more than $2.2 million from reduced winter maintenance costs. Given that the program costs approximately $200,000 to operate, the result translates into a benefit-cost ratio of over 11:1. To address challenges resulting from localized high crosswinds, both Oregon and California Departments of Transportation (ODOT and Caltrans, respectively) have used intelligent transportation system (ITS) installations on Route 101 to automatically alert motorists of dangerously windy conditions. Such a system is known as an Automated Wind Warning Systems (AWWS). US Route 101 is a very important corridor for the movement of freight and tourists in both States, so it is critical to keep this highway open. As part of this process, ODOT performed a BCA on the AWSS to evaluate its effectiveness in meeting their objectives. The analysis measured key safety factors by looking at crash data for the years 1997-2003. It also evaluated other factors such as efficiency, customer satisfaction, and reliability and productivity and quantified operational cost savings. The benefit cost ratios from this study were assessed at up to 4:13. De-icing is the practice of removing snow, ice, and slush from a roadway surface. The process incorporates de-icers and plowing to melt existing snow and ice as well as to prevent snow and ice from forming a bond with, or freezing, the pavement. This case study, extracted and adapted from the Clear Roads Pooled Fund Program's User Manual on Development of a Toolkit for Cost-Benefit Analysis of Specific Winter Maintenance Practices, Equipment and Operations, presents the results of a BCA using the toolkit for de-icing operations. Additional information on the Clear Roads Pooled Fund's Toolkit can be obtained from http://clearroads.org. The compendium includes a systematic overview of the process employed when using the toolkit to evaluate de-icing operations. The agency parameters and values (dollars and percentages) used in the example are for demonstration purposes only. These factors, as well as the benefit-cost ratios consequently generated, represent only a potential outcome under a theoretical scenario and do not represent a recommended configuration for deicing. As the results indicate, the benefit cost ratio of deicing procedures can reach up to 34:1. Minnesota Department of Transportation (MnDOT) developed a freeway gate closure system for directing traffic off Interstates and prohibiting access during unsafe driving conditions such as severe snowstorms and major incidents. This system uses gates on the mainline and at entrance ramps to direct traffic off an Interstate and to block traffic accessing an Interstate. A year after implementation, the use of gates proved beneficial and their application continued to spread in Minnesota. MnDOT became increasingly interested in documenting the installed system and identifying any opportunities to enhance gate operations further, particularly through the utilization of intelligent transportation systems. As a result, it performed a BCA on gate closure systems implemented in Minnesota that documented and evaluated their the State's implementation experience, identified issues, and recommended enhancements to the current operations. The BCA focused on the cost of deployment along with the associated benefits due to reductions in delays and accidents. The annual frequency of snow- and ice-related accidents and hourly volume data were used in the analysis; total system costs, including maintenance costs, were calculated over a period of 10 years. The analysis concluded that the MnDOT system offered benefit-cost ratios of up to 3:1. Local transportation agencies also use Maintenance Decision Support System (MDSS) for winter maintenance. This is appropriate, considering the increasing trend in local winter maintenance expenditures. In fact, all local agencies combined spend more than all State DOTs combined on snow and ice removal activities. The City and County of Denver, a consolidated city and county, faces many of the same challenges as other local agencies around the country, including budgetary and technological constraints. Nevertheless, Denver's street maintenance division was eager to participate in an evaluation of their MDSS and to learn ways to enhance winter operations and make better use of the MDSS tool throughout the jurisdiction. The case study presents the actual results of a BCA on the use of MDSS over two winter periods: 2007-2008 and 2008-2009. To provide comparable benefits and costs within the analysis, Denver selected key measures of effectiveness to primarily focus on benefits to the implementing agency, including labor, equipment, and material savings. The evaluation was designed to be a "with-without MDSS" analysis intending to quantify the two benefit areas: (1) those resulting from atmospheric and pavement forecasts and (2) those resulting from treatment recommendations. The study team reviewed data from previous winter events, some when MDSS was fully operational and others when it was not. By studying the crash and travel outcomes as well as agency operation costs, researchers assigned costs and benefits to individual events with and without MDSS. Overall, the MDSS provided a positive net benefit-cost trade-off, with the average annual benefits exceeding the costs. For every $1 that Denver spent on the MDSS, it achieved $1.34 in return. Denver gained a net benefit (Net Benefit = Total Benefit – Total Costs) of $24,304 per year from the use of the MDSS. If you have any questions regarding Road Weather Management BCA please contact one of the individuals below. 1 C. Strong and X. Shi, "Benefit Cost Analysis of Weather Information for Winter Maintenance," Transportation Research Record: Journal of the Transportation Research Board, 2055(2008): 119–127.